by Yahya Barzanji and Sameer N. Yacoub, Associated Press. December 22, 2010. KIRKUK, Iraq – Iraqi Christians on Wednesday called off Christmas festivities across the country as al-Qaida insurgents threatened more attacks on a beleaguered community still terrified from a bloody siege at a Baghdad church two months earlier. A council representing Christian denominations across Iraq advised its followers to cancel public Christmas celebrations out of concern over new terror attacks and as a show of mourning for the victims of the church siege and other violence. Church officials in the northern cities of Kirkuk and Mosul, the southern city of Basra and in the capital confirmed they will not put up Christmas decorations or hold evening Mass and have urged worshippers to refrain from decorating their homes. Even an appearance by Santa Claus was called off. "Nobody can ignore the threats of al-Qaida against Iraqi Christians," said Chaldean Archbishop Louis Sako in Kirkuk. "We cannot find a single source of joy that makes us celebrate. The situation of the Christians is bleak." Christians across Iraq have been living in fear since a Baghdad church attack in October that left 68 people dead. Days later insurgents targeted Christian homes and neighborhoods across the capital with a series of bombs. An al-Qaida front group that claimed responsibility for the church siege vowed at the time to carry out a reign of terror against Christians. The Islamic State of Iraq renewed its threats in a message posted late Tuesday on a website frequented by Islamic extremists. The group said it wants the release of two women it claims are being held captive by Egypt's Coptic Church. Muslim extremists in Egypt say the church has detained the women for allegedly converting to Islam. The church denies the allegations but extremists in Iraq have latched onto the issue. The message Tuesday was addressed to Iraq's Christian community and said it was designed to "pressure" Egypt. Sunni Muslim extremists that make up groups like al-Qaida perceive Christians to be nonbelievers aligned with Western countries such as the U.S.
Few reliable statistics exist on the number of Christians in this nation of 29 million. A recent State Department report says Christian leaders estimate 400,000 to 600,000 remain, down from a prewar level as high as 1.4 million by some estimates. Since the deadly church siege, the U.N. estimates some 1,000 Christian families have fled to the Kurdish region in northern Iraq which is generally much safer. For those who remain, this Christmas will be a somber affair. In the northern city of Kirkuk, 180 miles (290 kilometers) north of Baghdad, Sako said church officials will not put up Christmas decorations outside the church and urged worshippers to refrain from decorating their homes. A traditional Santa Claus appearance outside one of the city's churches has also been called off, he said. Money usually used on celebrations or gifts will instead go to help Christian refugees, he said. Ashour Binyamin, a 55-year-old Christian from Kirkuk said he and his family would not go to church on Christmas but instead would celebrate at home. 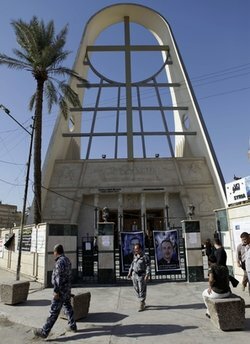 At Baghdad's Our Lady of Salvation church where more than 120 parishioners were held hostage by gunmen on Oct. 31, there will be no Christmas tree and Mass on both Christmas Eve and Christmas day has been canceled. Only a modest manger display representing the birth of Jesus Christ will mark the occasion. "We have canceled all celebrations in the church," said Father Mukhlis. "We are still in deep sorrow over the innocent victims who fell during the evil attack." In the Karradah neighborhood, where many of the city's remaining Christians live, a number of churches were guarded by security forces Wednesday and surrounded by razor wire. Shop owners in the neighborhood said few people were buying the Christmas trees and Santa Claus toys on sale. One Christian woman vowed to go to church on Christmas Day, despite what she described as the failure of the government to protect her small minority. But she would not be visiting any friends during the holiday season because all of them have already fled the city. "We did not put any decorations inside or outside our house this year," said Ikhlas Bahnam. "We see no reason to celebrate." In Mosul, 225 miles (360 kilometers) northwest of Baghdad, Syrian Orthodox priest Faiz Wadee said there will be no public Christmas celebrations either. Christians in Iraq's second-largest city of Basra, 340 miles (550 kilometers) southeast of Baghdad decided to cancel all celebrations as well. Saad Matti, a Christian legislator on the Basra provincial council, said the decision was made out of respect for the victims of the church siege and because of the al-Qaida threats. "There will be only a small Mass in one church in Basra without any signs of joy or decoration and under the protection of Iraqi security forces," he said. "We are fully aware of al-Qaida threats." Matti said Christians would also tone down their celebrations out of respect for a Shiite holiday going on at the same time. The majority of Iraqis are Shiite Muslims, especially in the south. Even among Iraqi Christians who've managed to escape the violence here, the mood was subdued. Maher Murqous, an Iraqi Christian from Mosul who fled to neighboring Syria after being threatened by militants, said his relatives are still at risk in Iraq. Since they cannot celebrate, neither will he. "We will pray for the sake of Iraq. That's all we can do," he said. Yacoub reported from Amman, Jordan; Associated Press writers Sinan Salaheddin and Rebecca Santana in Baghdad and Albert Aji in Damascus, Syria contributed to this report.